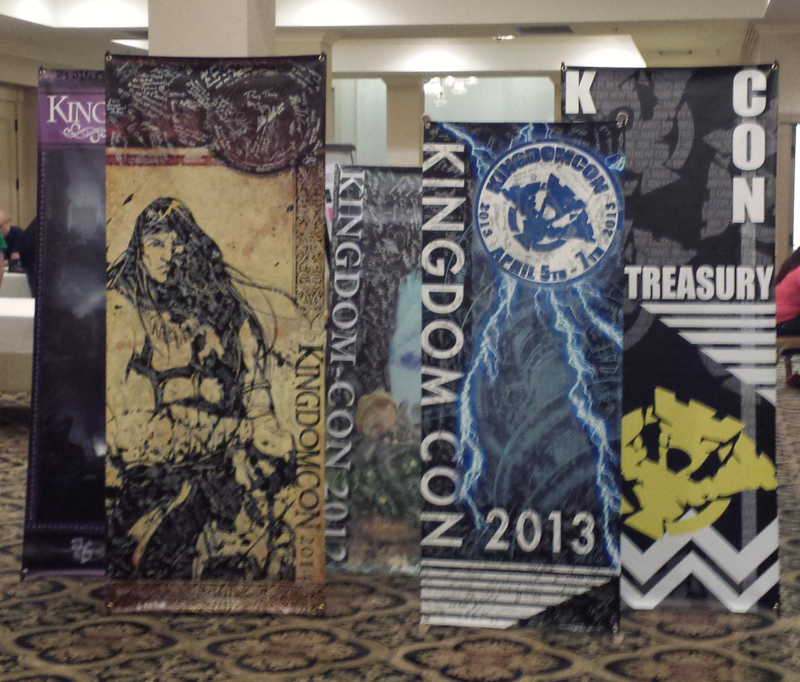 This was our second year at Kingdom-Con hosting the Game Crafter table. And just like last year it was a great experience. The convention may be small when compared with something like Gen-Con, but it bustles with energy and people playing games late into the night. I know I was up way past my normal bedtime. Our table was at one end of a large room entirely dedicated to board games. There were 10 rows of tables, which by Friday evening weren't quite filled up. On Saturday, they were! We gave a healthy mix of game demonstrations and Q&A regarding The Game Crafter website and game designing in general. Sales for us were brisk and we were quite pleased. We even had some repeat business this year, as people who purchased our games last year purchased them as gifts for friends this year. I don't believe we ran as many demos this year, but I felt that we had a lot more people that came by to talk specifically about and ask questions about Game Crafter's services. At one point a gentleman walked into the board game room and made a bee line for our table. "Great!" he announced, "You are here again. I have questions for you." Talk about being Johnny-on-the-spot! 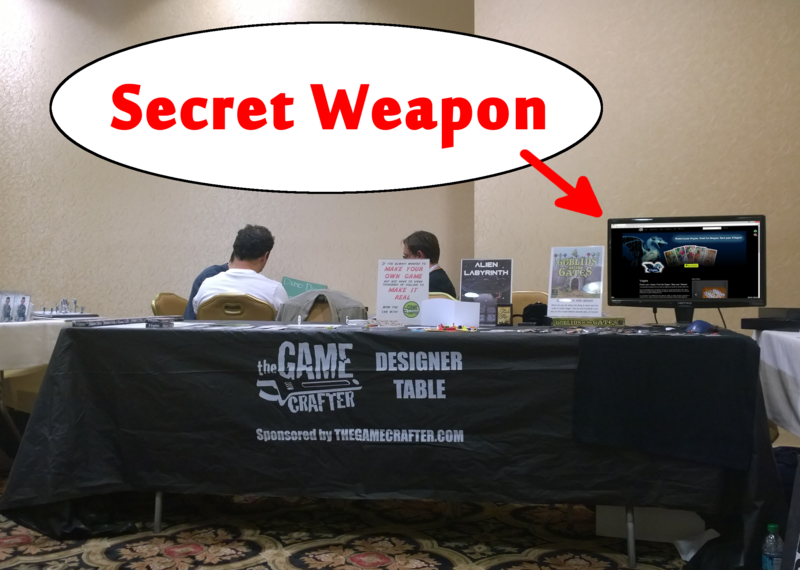 But all was well, since we had our secret weapon all setup and ready to go! Having a computer with internet access setup made answering his questions easy. I just pulled up the website and we went over his questions one by one. Especially that really hard question, "how much will it cost?" Apparently, it can be a little intimidating to get started; in truth there is a lot going on at the Game Crafters site. I made sure to point out the forums and the chat feature and stressed the community behind the site. One person thought there would be a charge to use the site and was really pleased to discover there wasn’t. We emphasized the variety of game parts, game styles, game themes, and game mechanics already being explored by independent game developers on the website. Robert Huss was at the table with us and he had lots of great advice for new developers. He, also, shared that he was at Gen-Con at Game Crafter's booth and that was definitely a big selling point. He ran demos for his games Alien Labyrinth and The Shadow Over Westminster. Of course, while working the table we played our own card game Virgins. We also got in a few hands of our new expansion decks. 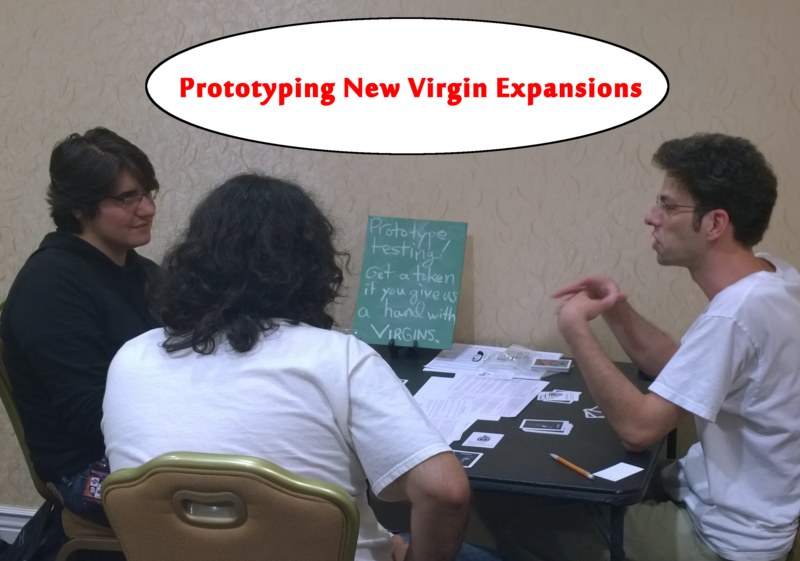 The plan for the expansion decks is to have separate three player decks that can combine with either the original Virgins deck or each other. This allows more players and lets us introduce some fun new rules. Speaking of rules, we printed our rules on stiff cardstock and that made them a lot easier to work with for demos. Obviously, we used Game Crafter’s for our proto-type cards opting for a clean icon based card. It was very well received. It is great when you can get live feedback and when you can incorporate that back into your prototype so easily. We used icons from Game-icons.net. Check them out. There is some amazing work there. We also used the new sticker pawns and they were a big hit. The other great thing about attending Kingdom-Con this year was catching up with other indie game designers. 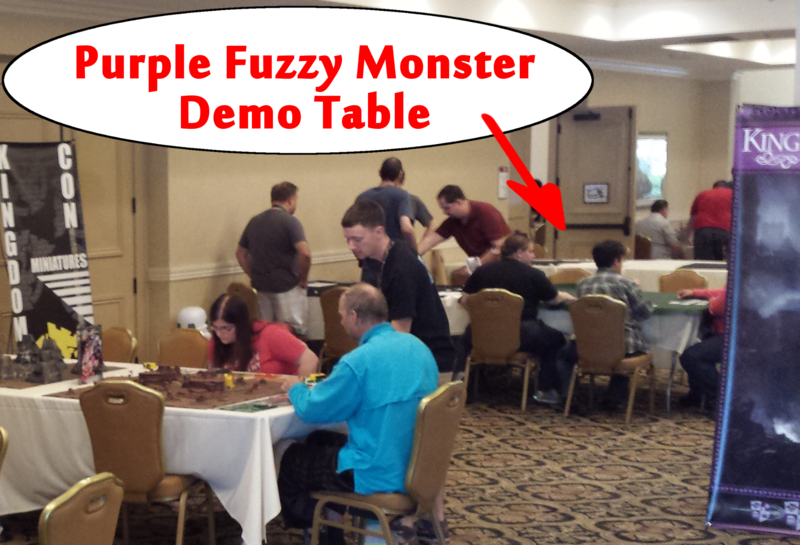 Purple Fuzzy Monster Games were there again and along with their game Starships they were also showing off a new card game, "Aliens Built My Hot Rod." A fun, fast - pun intended - drafting card game. They printed the prototype cards using Game Crafter's after seeing our card game last year. It is a lot easier to use The Game Crafter's website than hand drawing fifty or so cards. Alongside our old friends we got to meet lots of new people and let them now about Game Crafters. One vendor we spoke too thought that getting custom tuck boxes made in order to build mini-decks to send out to reviewers would be a good idea. Much more presentable than just a loose stack in a plastic baggy. It's all about the presentation. In closing, we would like to thank Lindsey Bell for helping out and for making the all important coffee run. Last year's convention was Lindsey's first and she like it so much she came back this year. We agree with her and are plan on being at Kingdom-Con next year.